The shoe was last released in 1999, and along with the original Black/Cement Grey colorway, is arguably responsible for the entire Jordan Retro craze that is still going strong today. By now you that the classic "Cement" Air Jordan 4 will be making a return to retail next February. Worn by "Money" during the 1988-1989 NBA season (and by Buggin Out in Do the Right Thing! ), the Tinker Hatfield-designed masterpiece featured distinct design elements such as vented mesh side panels, support wings, Flight branding and cement grey speckle print throughout. The shoe was last released in 1999, and along with the original Black/Cement Grey colorway, is arguably responsible for the entire Jordan Retro craze that is still going strong today. Thirteen years later, the "Cement" 4 is set to cause a little chaos once again. 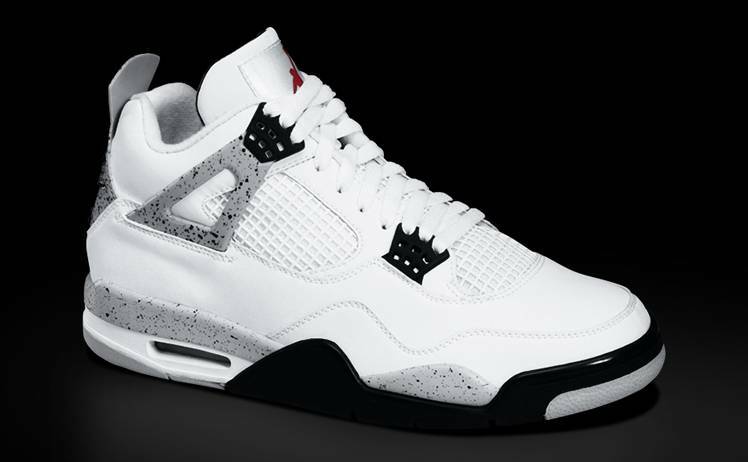 For those looking to pinpoint an exact date for the "Cements," you can mark down Saturday, February 18th for a release. They'll drop in sizes ranging from adult to toddler. Retail for the men's sizes is $160. Also, expect more than enough pairs to be available. While you're waiting, take a look back at Michael Jordan wearing the original "Cement" Air Jordan 4.